Time to unwind ladies! This DIY will help you find your calm, relaxed self. 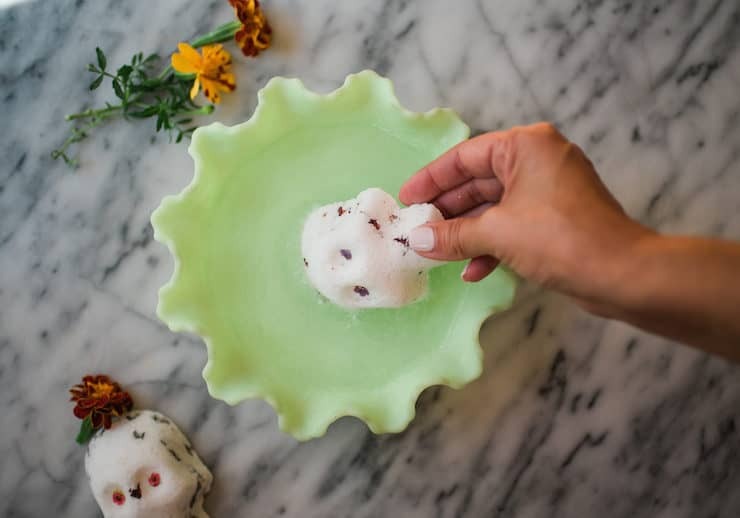 Bath bombs are all the rage for good reason — they boost bath-time to a whole new level. The fizzy mist, unleashes soothing scents while you gently soak in a tub surrounded by floating flower petals. Doesn’t this sound regal?! 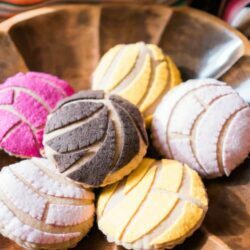 It is amigas, and you deserve it! 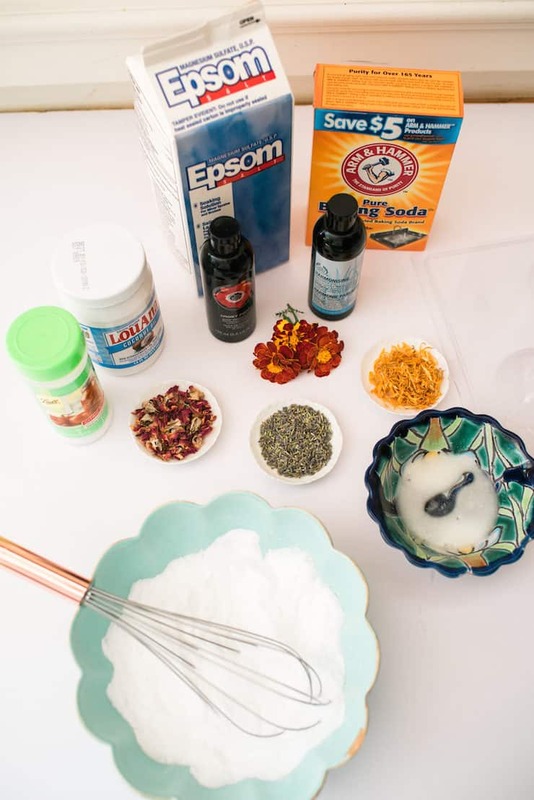 If that description didn’t hook you, perhaps this will — bath bombs are super easy, inexpensive and fun to make. This DIY is a great craft project for a teenage sleepover. 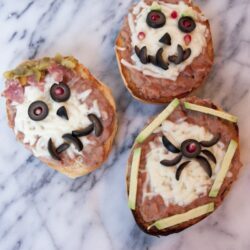 My daughter is looking forward to making these with friends. Girls can have fun selecting their favorite scent combinations, dried flowers, and shapes. The best part is that everyone can take home her own creation. 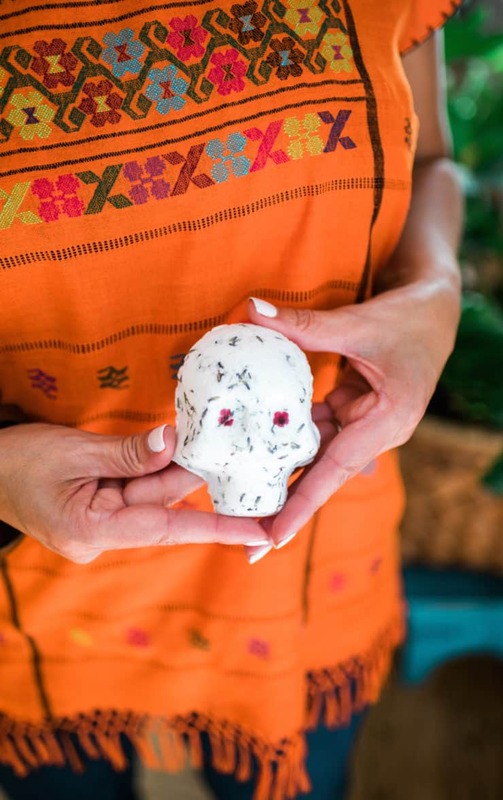 We created these unique bath bombs with a Muy Bueno / Dia de los Muertos twist using sugar skull molds. Aren’t they cute? 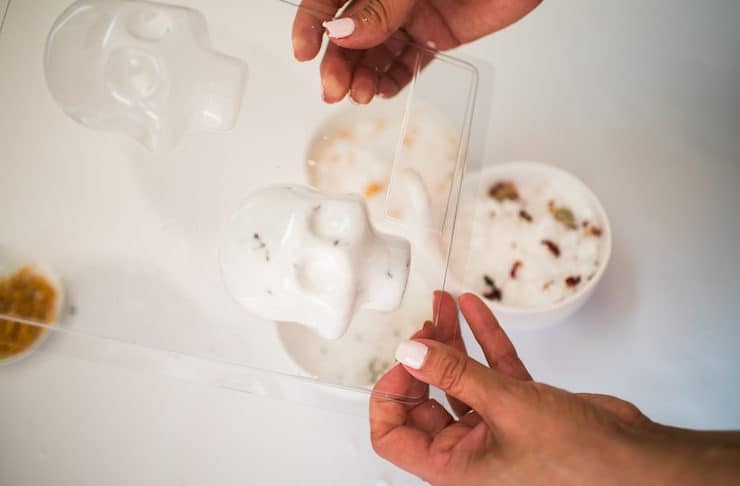 Of course, you could use any mold you already own, like a cupcake pan, small bowls, ice cube trays, or this skull mold similar to ours. This heart mold makes lovely bombs too. As far as ingredients go, all of the oils are interchangeable along with the scents. For ours we used coconut oil, but you can use grape seed oil, sweet oil, or even olive oil. For our scents, we used tobacco flower and smoky poppy massage oils. We have also made them using essential oils and home fragrance oils. If you don’t have fragranced oils, you can simply purchase the Epsom salts pre-fragranced. Adding lavender, marigold, chamomile and red rose buds and petals are just some examples of what we used but also not necessary. If you decide to incorporate dried goodies, be aware of your drain, as you will need to scoop this out after your bath. 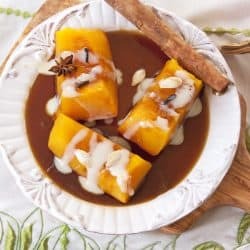 Many other recipes incorporate food coloring. We chose not to use food coloring, but in all honestly, there are no wrong combinations. 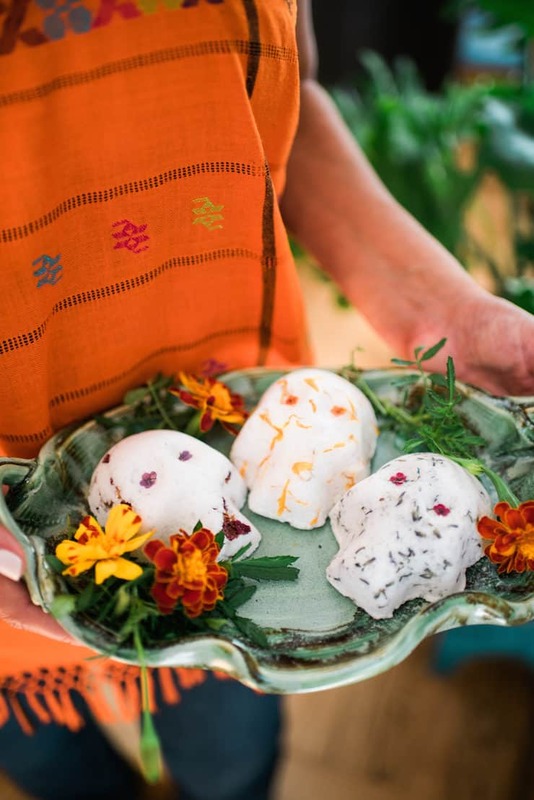 Just have fun and be creative – these bath bombs make lovely hostess and housewarming gifts. I promise that your lady friends will be especially grateful. In a large bowl stir baking soda, citric acid, and Epsom salt together with a whisk. In a separate bowl combine the coconut oil, essential oil, and water. Whisk together as thoroughly as possible and then gradually poor the liquid on dry ingredients while whisking. Use your hands to get everything mixed up thoroughly and to the right consistency. When you can form a solidly packed ball with your hands, you can stop mixing and adding. If needed, add small amounts of oil and water. 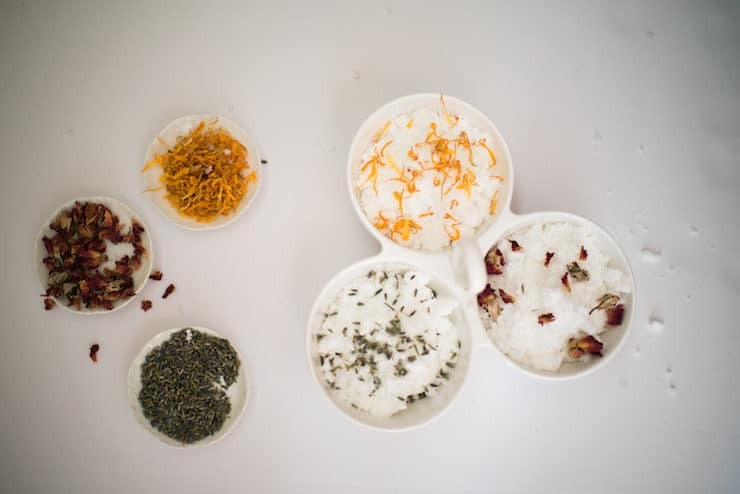 To create fun choices, separate the mixture evenly into three bowls for the dried flower additions. Add a healthy pinch of dried flowers of choice to each mixture and combine with your hands. If you’d like the flowers to be the top layer, simply add the pinch to each mold before the bath bomb mixture. 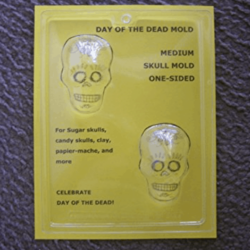 Stuff the malleable ingredients into the skull mold, or mold of your choice. Do not overfill as the mold will expand while drying. Put the filled molds in a dry location and let sit overnight. The next day, gently remove the bath bombs from the molds. This is when we applied the pressed, small flower-tops for eyes. Oh my goodness! These are adorable! These are fabulous! I have a ton of lavender I dried this Summer and need a way to use it up. I host a weekly link party every Thus that starts @ 8PM Eastern. Would love you to stop by and link up! Very interesting, yes they would make a great gift. Could get molds for different occasions. Great idea.